Tag Archives: 집 가격이 어떻게 되나요? 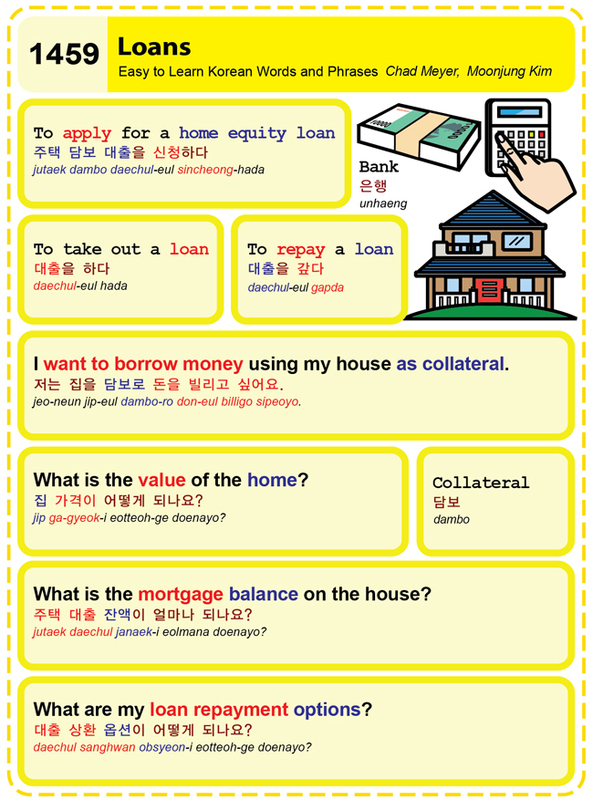 Easy to Learn Korean 1459 – Loans. Posted in Series	| Tagged bank, Collateral, I want to borrow money using my house as collateral., loans, To apply for a home equity loan, to repay a loan, To take out a loan, What are my loan repayment options?, What is the mortgage balance on the house?, What is the value of the home?, 담보, 대출 상환 옵션이 어떻게 되나요?, 대출을 갚다, 대출을 하다, 은행, 저는 집을 담보로 돈을 빌리고 싶어요., 주택 담보 대출을 신청하다, 주택 대출 잔액이 얼마나 되나요?, 집 가격이 어떻게 되나요?